Various film posters adorn the walls of my bedroom and have done for the last ten years. I currently have seven framed prints in my room and back at my parent’s house my previous bedroom still features colossal framed images of Rear Window, Sleeper, Blade Runner and Raise the Red Lantern. Next to my expansive film collection sits my favourite. This much smaller black frame holds a glorious but somewhat quainter poster of Tom Ford’s A Single Man. One of my favourite films of the last decade, A Single Man was desperately sad and beautiful and utterly stylish. I was won over by the film’s emotive story but equally dazzled by the contrasting warm and cold hues that changed from scene to scene. Seven years later, the film’s director has returned with an equally stunning movie which has a much more sinister heart. Being both a fashion designer and a film director, Tom Ford has spoken about his desire to keep both worlds separate – yet his movie making is, above anything else, stylish. His return comes in the shape of Nocturnal Animals – a complex, layered work, taking place in three different worlds. Susan’s lavish and decadent life is interrupted when her ex-husband sends her a copy of his soon-to-be published first novel. Dedicated to her and inspired by her, the book is one of sorrow, anger and bloodshed. We read along with Susan who not only visualises the book but also starts to reflect on memories of their passionate and tragic marriage – Susan’s reality, reading and reminiscing form the three entwining strands of Nocturnal Animals. Susan’s world is one of misery, facade and cruelty, emphasised by its bleak aesthetic. Amy Adams’ is pale and serious – poles apart from the woman we witness her to be in flashbacks. The world she reads about it also one of cruelty, filled with symbolism and similarities with the reality surrounding her. Within the pages of the novel, Jake Gyllenhaal plays a father and husband left bereft following a grizzly run-in with a hillbilly gang. 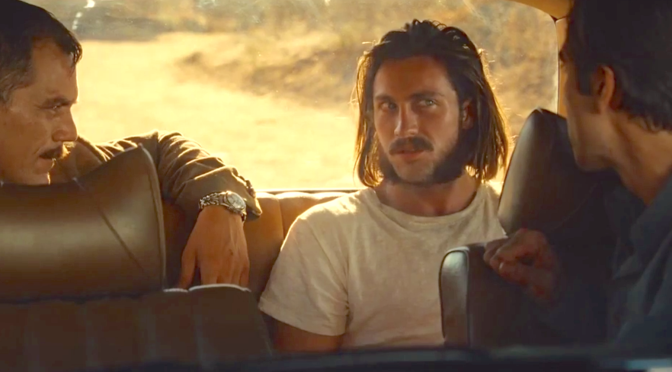 Aaron Taylor-Johnson leads the red-neck pack in a performance that repeatedly verges on becoming a caricature. Michael Shannon completes this trio of hyper masculine anguish as a controversial Texan cop with nothing to lose. I enjoyed being in all three worlds particularly as Ford begins to masterfully entangle them. Nocturnal Animals draws to a savage and unsatisfying end that I enjoyed but just didn’t buy. I struggled with Nocturnal Animals in a similar way to Neon Demon – the latter having none of the redeeming qualities or intelligence of Ford’s second film. It’s not as simple as this being a matter of style over substance; it’s an issue with the very core of the movie. Ultimately, you realise there just isn’t enough to believe in or care about. A masterclass in dream-like filming, Nocturnal Animals lacks a conclusion as brutal as its narrative. It’s ultimately unable to unpick good in the same way it does evil. Ford’s life as a fashion designer is evident even if he wishes it wasn’t. It’s a film with sharp cheekbones and a sultry expression – beautiful to look at but somewhat isolating for its audience. Tags: A Single Man, Aaron Taylor-Johnson, Amy Adams, Cinema, Drama, film, Film Review, Horror, Jake Gyllenhaal, michael shannon, Movie, Movie Review, nocturnal animals, Review, Tom Ford. Bookmark the permalink. Previous post ← Train to Busan.